Our product range includes a wide range of patiala vol-07 salwar suit, catwalk latest kurti and palazzo set, alankar vol-3 party wear salwar suit, asopalav vol-04 designer suits, shangar vol-07 designer suits and salwar kameez. Full Set : 9 Pcs. 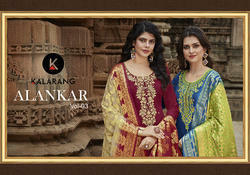 This season assortment brings your wardrobe too close to great looking colors and fantastic patterns. This designer embroidered dress material made from georgette fabric Maroon color kameez with shantoon inner,Beige color shantoon bottom with embroidery work and chiffon dupatta which gives you front in every occassion. We are the leading manufacturer of Lehanga suit ,having wide variety of design and color . Full Set : 8 Pcs. Accentuate your feministic beauty with this elegant look. With well rich colour and mesmerizing design its an elegant ethnic ensemble which you must adore.This Product reach to you as a Western wear Unstitched Chudidar vintage fashionable suits with Fabric of (Top: Pure Cotton Weaving Butty,Bottom: Pure Cotton,Duptta: Chiffon with heavy work, Inner:NA),Color of (Top: Purple, Bottom:Yellow, Dupatta:Yellow ) with measurement of (Top:2.5 Meter, Bottom: 2.5 Meter,Dupatta:2.25 Meter, Inner:NA).100% Genuine Manufacturer Product from KVSFAB. Experience share class this season with our latest collection. Fabulous class suit in briliant shades of blue. This designer embroiderd dress material made from georgette fabric dark Blue color kameez with inner,White color shantoon bottom with embroidery work and chiffon dupatta which gives you front in every occassion. Turn every head your way as you stroll across in an outfit from the new Indian cross collection. This designer embroidered dress material made from georgette fabric Red color kameez with shantoon inner,Off-White color shantoon bottom and chiffon dupatta which gives you front in every occassion. Rani Pink is an important color this year, and fused with aquamarine light, it becomes like majestically elegant. This designer embroidered dress material made from georgette fabric Rani pink color kameez with shantoon inner,Beige color shantoon bottom with embroidery work and chiffon dupatta which gives you front in every occassion. Embrace pure elegance with alluring floral patterns on lacy fabric and add glamour to your style. This designer embroidered dress material made from georgette fabric Pink color kameez with shantoon inner, Red color shantoon bottom with embroidery work and chiffon dupatta which gives you front in every occassion. The colors are fresh for the season, the prints are delicate over economical quality fabrics that enthuses once you buy you indulge into an inspirable journey of fabrics that never fades out of the style horizon, updat your wardrobe with season's fresh new floral and on trends hues. This designer Embroidered dress material made from georgette fabric Cream color kameez with shantoon inner,Orange color shantoon bottom and chiffon dupatta which gives you front in every occasions. 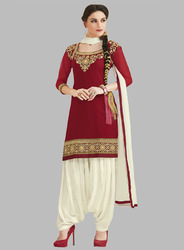 Comes with matching maroon faux shantoon embroidery bottom and with maroon faux chiffon lace border work dupatta. Unlimited temptation to brighten up your look with an array of floral print that will take you through the season in style. This designer Embroidered dress material made from georgette fabric Grey color kameez with shantoon inner, Black color shantoon bottom and chiffon dupatta which gives you front in every occasion. A Shantoon embroidered Patiala and Faux Chiffon Dupatta in Dark Pink comes along. Do Note: Slight variation in actual color vs. image is possible along with patch border work. Shade of Red bring opalence shades to your season dressing, give a glamorous touch to your personality with a blend of charming hues. This designer embroiders dress material made from Georgette fabric Red color kameez with shantoon, Black color shantoon bottom with embroidery work and chiffon dupatta which gives you front in every occasion.